The 7 shanks have removable shovels while the 13-inch pneumatic tires help get the job done. A durable powder-coat finish makes this a long-lasting Tuff product. 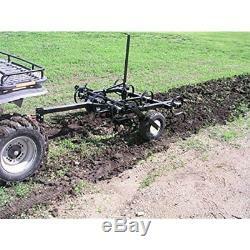 Easily get your cultivating done Field Tuff's 48 ATV Tow-Behind Cultivator. Works behind 500cc larger ATVs UTVs. Covers a 48-inch wide path for large coverage. Adjustable depth control manual lever for raising lowering to cultivate where it's needed. 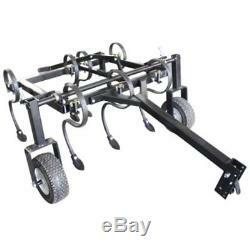 The pin-style hitch adjusts to the height of the towing vehicle for easy attaching. 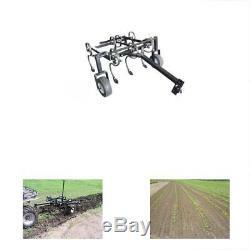 Field Tuff brings you the 48 ATV Cultivator. This cultivator can be used ATVs UTVs has a pin-style hitch to adjust the cultivator to the height of the towing vehicle. Covering a 48-inch wide path, adjustable depth control a manual lever for raising lowering, this is a product that will get the job done. The 7 shanks their removable shovels the 13-inch pneumatic tires only add to the quality of this product. The durable powder-coat finish ensures that this is a product that will last. Dimension: 30.5 x 50.25 x 11.5 inchs. 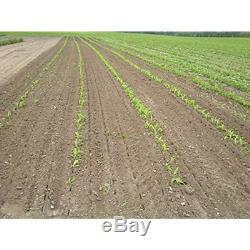 We will provide you with return labels along with the detailed instructions. Our feedback is VERY important to us. We are here for you! We promise we will try our best to solve your problem! We will try our best to provide good service to you. Running business is not easy. We will try our best to resolve any problem for you. If you have any question. We reply every message within 48 hours. If you did not receive our reply. We think maybe we did not receive your message. Please send us message again. Thank you for your business, your trust and your confidence. It is our pleasure to work with our customers. The item "Tillers 48 ATV Tow-Behind Cultivator" is in sale since Monday, April 16, 2018. This item is in the category "Home & Garden\Yard, Garden & Outdoor Living\Outdoor Power Equipment\Tillers".